ParetoMan - 21st century superhero? Not long ago, I wrote my post on the value of improving your strengths by only 10% (see "Related items" at the end of this post). What a lovely coincidence that, only a week or so later, I happened upon Richard Koch's book, "The 80/20 Individual". As you may infer from the title, this book discusses a personal improvement strategy based on the Pareto Principle, better known as "the 80/20 rule." 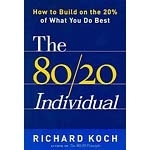 (Koch wrote this book as a follow-up to his 1997 book, "The 80/20 Principle" which I've never read). I've been pleasantly surprised by the depth, insight, and applicability of this book. Overall, this book is about how to maximize the impact of your individual wealth-creating capabilities by exploiting your top 20% most valuable skills, ideas, and activities. Even in large organizations, a lot of the power and growth comes from small teams and their ability to disproportionately exploit the resources of their larger parent. Koch tells us that, when companies enter the Fortune 50, their growth slows down dramatically. In fact, the research he cites found that 91% of companies entering the Fortune 50 never grew substantially again without acquisitions. His techniques are all centered on creating a growth "engine" to create wealth and achieve wild success. Based on the title, I was expecting this to be focused on individual strength development, and I expected to see a lot of the same kinds of "psyche yourself up" techniques present in many self-improvement book. Instead, I found a holistic approach to help you deal with and maximize individual strengths as they relate to success in business. There are exercises and advice in the book to help you tune your mindset to look for your strengths, as well as case studies to help you maximinze what Koch calls your "20% spike." The 20% spike is the "thing", in any endeavor, that provides unique, game changing differentiation for people who win. Koch spends some time discussing people like Bill Gates, Warren Buffett, and others to discuss how they've maximized their "20% spike." Anyone who's able to win by maximizing their 20% fall into a group that Koch terms, "80/20 Individuals." The "meat" of the book is 9 chapters called "The Nine Essentials of 80/20 Success." Each chapter has a philosophy, some examples, and advice to help you apply the nine essentials. Sure, there is a lot of business philosophy in here, but this book is more than a mind game exercise. I found that the case studies and "real world" examples really resonated with me. There are a couple, in particular, that I found to be very powerful. A story of a restaurant that has tuned the "slop" out of its processes to become a lean, mean, table-turning machine. This is a tremendous discussion of how to analyze and reduce waste within an internal process. I expect to see value from this in the process consulting that I do. You'll also enjoy the examples showing how Microsoft benefited from exploiting its early advantage in the OS market, how Plymouth Gin succesfully reinvented a 200+ year old company, the story behind Palm's initial spinout of Handspring, and much more. And you've got to read his rendition of how Wal-Mart innovated at the hand of Sam Walton. Captivating stuff. There is also a lot of great material in this book on how to identify when and where your best "breakthrough" ideas come from, and try to manufacture more opportunities within your week to create space for these ideas to occur more frequently. Essentially, if you buy into the 80/20 rule, you're trying to figure out what things happen during that "20 time." In order to focus more on your valuable 20%, there is a discussion of how to "outsource your 80%" both at the individual and company levels. This includes how to hire people with complementary skills, how to identify candidates for things to outsource, and the like. After reading this book, I believe there are truly some "game changing" insights in "The 80/20 Individual." In particular, the treatment of creating leverage within a larger organization through "joint ventures" and other creative structures is cool stuff. If I can successfully apply even half of the Nine Essentials Koch presents, I'll be better off. Why not snag a copy and see if you agree?